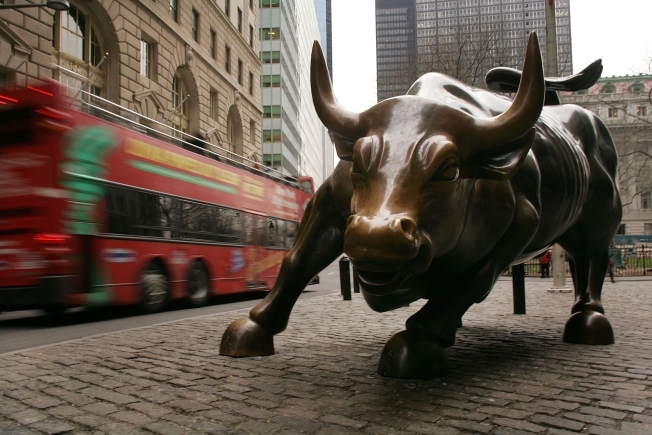 Pols are bearish on Wall Street. A very unhappy birthday to you, Wall Street bailout! Democrat Rep. Joe Sestak, who is running for the Senate in Pennsylvania, is airing an ad comparing his 2008 vote for the bailout to cleaning up the poop from his dog, Belle. "It made me sick to bail out the banks, but I had to clean up the mess left by these guys. They let Wall Street run wild," Sestak says in the ad, gesturing to a photo of his Republican opponent Pat Toomey and former President George W. Bush. In his ads, Toomey says he worked on Wall Street 20 years ago, before becoming a restaurateur in Allentown, Pa. “Way back then, I learned that Wall Street is the last place that should ever get a taxpayer bailout,” he tells viewers. Candidates often loosely use the term “bailout” to cover three different programs: the Troubled Asset Relief Program; the $14 billion auto industry loan program; and the federal government’s ownership of home mortgage guarantors Fannie Mae and Freddie Mac. During the 2008 financial crisis, the federal government took over Fannie Mae and Freddie Mac, which guarantee more than half of the residential mortgages in the United States. It has subsidized them with $148 billion since 2008. Weeks later — and only a few weeks before the 2008 election — Congress voted to authorize TARP. Republican presidential nominee John McCain and GOP Senate Leader Mitch McConnell voted for it, as did then-Sen. Barack Obama and most Democrats in Congress. DeMint said the bailout might make the nation's problems worse. “As you can tell, I'm a little bit angry," he said, in comments reported by the Charleston Post and Courier. DeMint wasn’t the only one who was angry.Republicans have learned the lesson of 2008 and are now using the bailout to batter Democrats who supported it. Boucher ran unopposed in 2008, but faces a strong challenge from Republican Morgan Griffith. The GOP is running similar ads across the nation, from South Carolina — where it’s slamming Rep. John Spratt — to North Dakota, where Republicans use TARP to link Rep. Earl Pomeroy to House Speaker Nancy Pelosi. The TARP vote has already caused intraparty casualties on the Republican side, with Alaska Sen. Lisa Murkowski, Texas Sen. Kay Bailey Hutchison, Utah Sen. Robert Bennett, and South Carolina Reps. Bob Inglis and Gresham Barrett all losing primary contests this year partly due to their votes for TARP. TARP isn’t exclusively a Republican issue. As some Democrats did in while running against Republican candidates (like McConnell) in 2008, they're again using the TARP vote as a weapon. Case in point: the Missouri Senate race where Democrat Robin Carnahan has blasted Rep. Roy Blunt for his efforts to pass the bill when he served as House GOP whip. But did Blunt, Sestak, and the others do the right thing in 2008? Did TARP do what it was intended to do? A report released Monday by the Special Inspector General for TARP, Neil Barofsky, gave the program a mixed report card. TARP, combined with other actions by the Federal Reserve and the Treasury, helped avert a financial collapse. His report also reminds taxpayers that although the Treasury’s authority to initiate new TARP investments has ended, $178 billion in funds are still being lent out or invested, and more than $80 billion is still available to spend. Barofsky is harshly critical of the Treasury’s handling of its assets of AIG, the former insurance industry giant. A recent Treasury report on AIG “fails to meet basic transparency standards” by not telling taxpayers that the Treasury has changed its accounting methods for its AIG investment, Barofsky says. “This conduct has left Treasury vulnerable to charges that it has manipulated its methodology” to make the AIG losses seem smaller than they are. And Barofsky’s report found that under a recapitalization plan agreed to by the Obama administration, taxpayers will end up owning 92 percent of AIG common stock, up from the 79.8 percent they owned in the first days of the AIG bailout. TARP does have its defenders, even a few Republican ones, although their voices aren't likely to be heard in the final days of the 2010 campaign. The non-partisan Congressional Budget Office said that financial firms are paying money back into the Treasury. In fiscal year 2010, which ended on Sept. 30, TARP repayments amounted to $108 billion. That compares to an outflow of $154 billion in TARP payments from the Treasury in fiscal year 2009. The Treasury estimates that TARP will end up costing taxpayers about $50 billion, way below the $700 billion ceiling Congress put on the bill when it created TARP. But an Oct. 4 report from the Government Accountability Office sounded a warning. Assessing TARP’s Capital Purchase Program, the GAO said the number of institutions missing the payments due on their CPP investments has jumped from eight in early 2009 to 123 in August 2010. The government also remains on the hook for the separate mortgage guarantee "bailout." Barofsky said in a report in July that the federal government has “an implied commitment” to stand behind Fannie Mae and Freddie Mac debt obligations, which amounted to $6 trillion — an amount equal to 43 percent of U.S. national income — at the end of 2009.